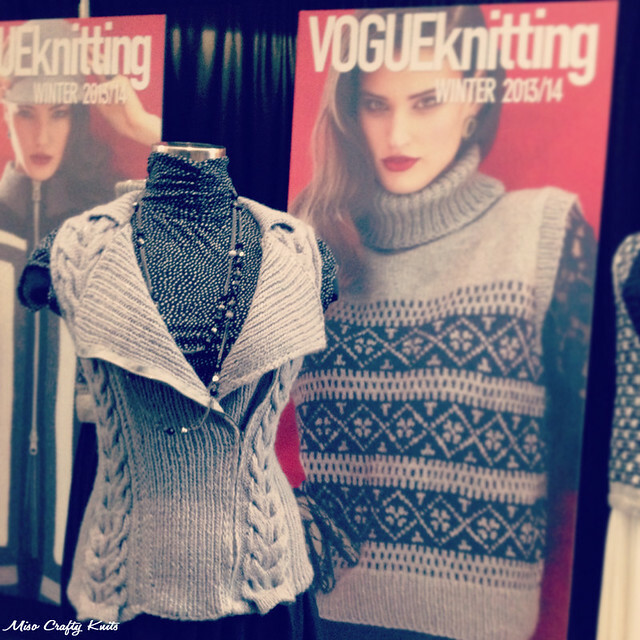 Ok, so I had promised a recap of Vogue Knitting Live and so here it is. Practically a month after the event! Oh well, better late than never, right? But I have to forewarn you, I'm totally lacking in the photo evidence department as (surprise, surprise!!) I either didn't take any photos or I just downright forgot that I had a smartphone that was capable of taking photos. I thought I took more than I actually did, but no...I didn't. It was all lies. I took a ton of photos last year and had to weed out the ones that I wanted to put up on the blog. This year? I have a measly four photos. So, so sad. But as I was going through my phone's camera roll, it dawned on me why I didn't take that many photos: my phone had refused to connect to the internet the.entire.time I was in the convention centre! Last year I had absolutely no problems. This year? Either the wifi signal was weak or my phone really is on the brink of dying, whatever it was I had NO internet. But the second I was out of the convention centre's range and mere megabytes into the hotel's (which was only a few blocks away), I was back up and running again on the internet. The internet on my phone would work everywhere but at the convention centre. What's up with that? Messed up, is what it was! Anyhoo, the photo you see above and the one just below this paragraph were taken on the Friday "preview" night of the market. The only time my internet had worked. Unfortunately I did not take any notes about the knit above. I've had several people ask me about it and all I can say is to check out the Winter 13/14 issue of Vogue Knitting. Otherwise I have absolutely no other information about it. Sorry! Let's get to the recap part, shall we? I promise I won't go into every minute detail, it will be a quick rundown. I swear. 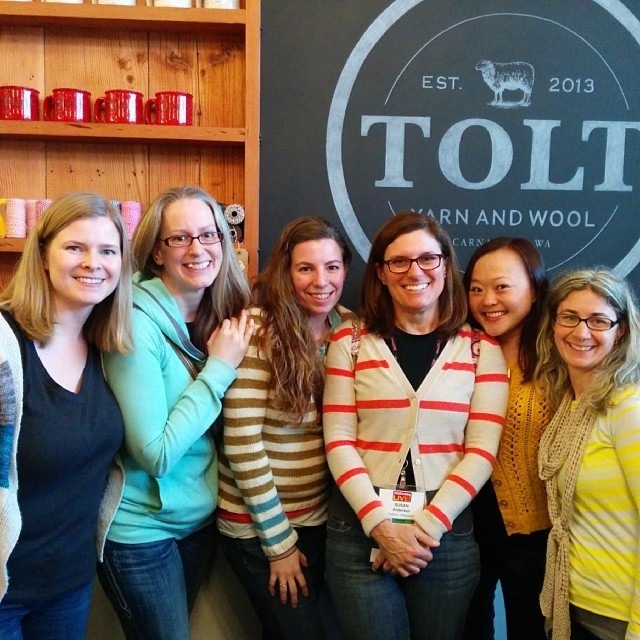 So...my lovely knitty friends and I had left Victoria before the crack of dawn on the Friday (March 14). Living on the island means that we have to catch a ferry to get to the mainland. Now some people dread the ferry, but me? I totally view it as knitting time. So I really don't mind the ferry at all. And when you're in a car full of knitters? Of course it's going to be a fun ferry ride! I was really hoping to knit like the wind on the way to Seattle (well, Bellevue. Since VKL isn't actually in Seattle), but halfway through the car ride all the caffeine I had consumed that morning had already passed through my system and I had passed out (but I wasn't the only one!). The snooze fest was short though, we made quick jaunts into Target and my very first trip to Trader Joe's, where I had purchased my weight in chocolate. Oh, I bought some fruit, coconut milk yogurt, and other healthy stuff, but the chocolate was the main focus. Seriously, I'm the world's biggest chocoholic there is. I think the only other person to vie for the title is my friend Jane. The Friday was pretty chill. My friends and I didn't have any plans in mind other than to chill out and to check out the Marketplace to see what this year's offerings were (and maybe to pre-plan the next day's big shop?). Since the day was so chill we took the opportunity to head over to Lot No. 3 to grab a bite to eat, and if you're all-out hard-core about your pulled pork like I am, this place is definitely a must. Not everyone was a fan of the place but those who tried the pulled pork were definitely swooning! Now onto the VKL Marketplace. The preview night. My initial thoughts: the crowd was way smaller than last year. But then again, we had arrived on the late side and maybe the crowds had shown up as the doors were opening and by the time we got there they had already gone? Either way, it definitely felt much quieter and as a result, I didn't feel so stressed out that all "the good stuff" was going to be taken. I'll admit it here, right now, that I was also a smidge disappointed. Last year there was so many new-to-me yarns and brands, a lot more indie dyers were being represented, and on top of that there were a lot of new things in general. This year, it felt like practically every booth had Madelinetosh on their shelves, Hazel Knits was everywhere (which was good since they didn't have their own booth this year), and nothing new popped out at me. Maybe I wasn't looking hard enough? A few of my friends and I had agreed that we felt a little...underwhelmed. Don't get me wrong, we had a ton of fun but maybe we had set our bar higher than we thought we had? By the end of the Saturday it dawned on me what felt so different about this year's event compared to last year's. Unlike last year, there was no big deal gala dinner; there was no speed knitting competition (which means my friend Liisa is still the reigning champ! ); Skacel wasn't the main sponsor and so they didn't have the huge booth front and center as you entered the Marketplace, with the massive Addi circular needle statue that you could pose and take photos with; and there was no music pumpin', high-energy, full of life and love Steven Be booth either. Actually, it seemed like there were less vendors this year and to make up for that the booths were made a fair bit bigger (which I'm totally not complaining about by the way!). I'll also admit that I was in a completely different head space this year. I credit the lack of internet for that as I was kind of forced into a real think-mode, which usually makes me overly quiet and probably not as socially engaged as I normally am at these type of events. Last year I bought yarn all willy nilly style without putting any sort of game plan into the yarn I was buying. This year, I had limited funds and so I had put a lot of thought into each and every purchase. Oh man, you guys would be SO proud of how much restraint I had shown! And be even more surprised to know that I had purchased only FOUR skeins of yarn during that one day? Ok, don't get excited. I did all my damage the next day, moments before we were leaving to head back to the island. Since we had a border to cross, a ferry to catch, and wanting to get home at a decent time, my crew and I had decided that an early departure was best. But we still had a good 30 minutes to do one last quickie look-over of the Marketplace before we left. So my friend Rebecca and I did just that. It was our downfall. Or at least it was mine for sure, as I ended up purchasing 3 skeins of yarn that I hadn't intended to buy (in my defense, one was suppose to be a gift). Maybe I shouldn't have gone back to the Marketplace to get Kitty Snips? Oh well, there's nothing I can do about it now. The yarn has been bought, it doesn't go bad, let's move on. 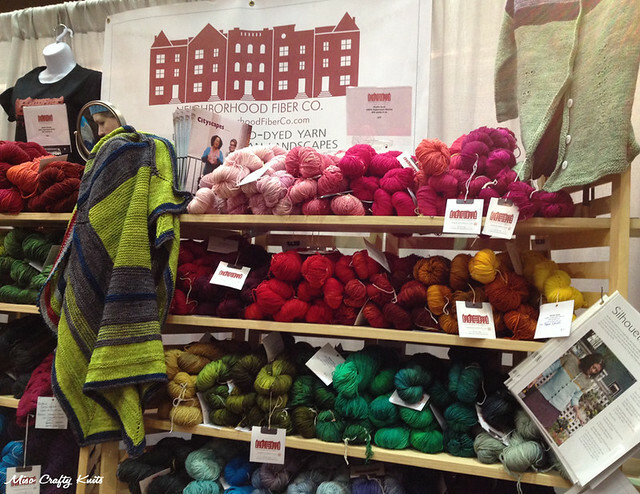 The major highlight of VKL in my eyes was the Neighborhood Fiber Co booth. I've only ever heard of this yarn via Ravelry forums, the blogosphere, and Joji Knits. I've never handled any Neighborhood yarns before, nor seen any of their colours in all their vibrant glories in person. I don't think any yarn shops in the province even carries Neighborhood Fiber Co! So to see and experience a massive booth of all their yarns was definitely quite a treat! Not only was the booth beautiful eye candy (seriously, this photo doesn't do the colours any justice whatsoever!) 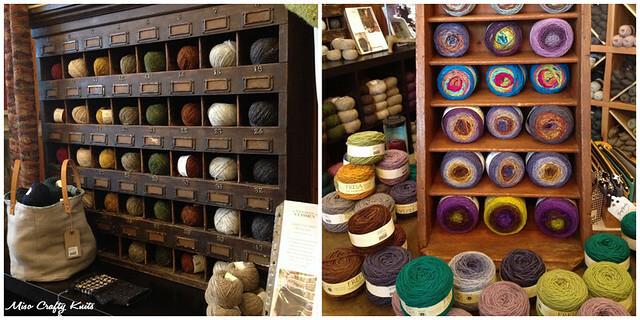 in yarn form, but there were also gorgeous samples and even the staff were outfitted in the most colourful knits. This was definitely a booth I kept going back to and where I had spent the majority of my budget. Of the few photos that I did manage to Instagram, a fair amount of people had commented how they were unable to attend VKL. Even a lot of my own knitterly friends weren't able to make the event. 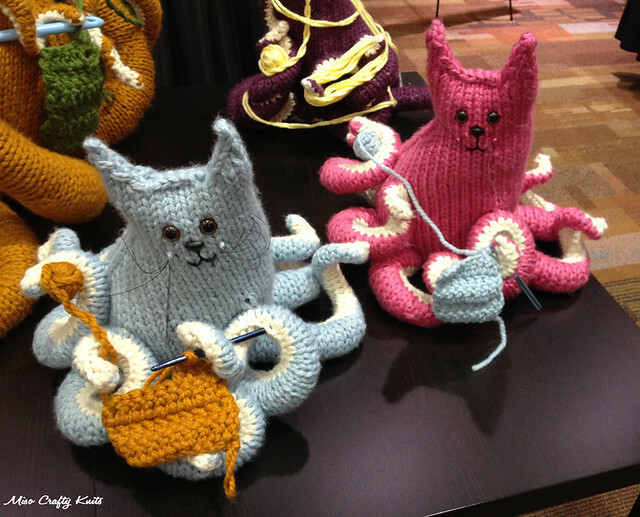 It has been speculated that VKL was just too close in date to Madrona (which was held in February) and there really wasn't enough time for knitters and fibre enthusiasts alike to recover and save up. I can totally see that. Regardless of the fact that so many people couldn't make it to VKL, I still managed to spot Tif of Dottie Angel (who I actually met in person and got to talk to later on), and Andi Satterlund of Untangling Knots (who I didn't have the lady balls to go up to and introduce myself to). Both ladies weren't hard to spot as they both have very distinct styles to them. I was really hoping to catch a glimpse of Ragga Eiríksdóttir, Mary Jane Mucklestone, and Amy Herzog, but I didn't. Sad face. But I did see glimpses of Mr. Brooklyn Tweed himself, Jarod Flood at the Churchmouse Yarns booth as well as at the hotel that I was staying at (and no, I did not say any outrageously inappropriate comments to him. If anything, I kind of just left him alone), Karen Templer of Fringe Association (I even scored one of her coveted tote bags! ), as well as Cirilia Rose (who I also left alone...didn't want to make an arse of myself 2 years in a row!). Actually, I'm quite proud of myself for not having any "I carried a watermelon" moments! Fist pump! But I wasn't all anti-social! My lovely friend Aja of the Etsy shop AkinJewels (I blogged about her awesome snag-free stitch markers here) made the voyage over (I've only seen her in person like, a handful of times and each visit is ever so short! ), and I got to unexpectedly meet a fellow blogger who's blog I've been following for a few years now - Cory of Indie.Knits! Hi Cory! Sorry if I seemed so space cadet-y!! 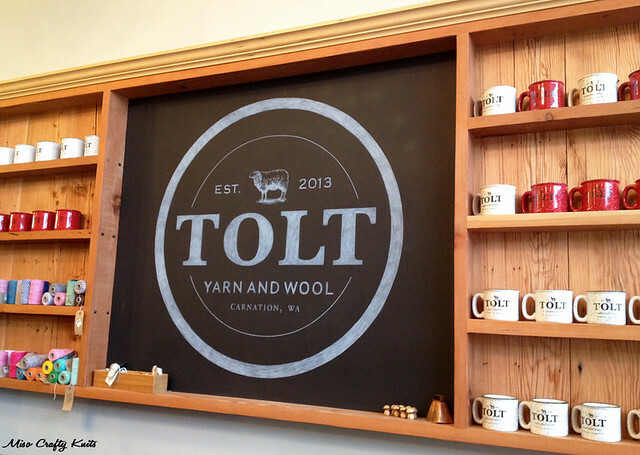 Another major highlight of my trip that has nothing to do with VKL but I thought I would squeeze it in here somehow: Tolt Yarn and Wool (I talked a bit about it in my March Obsessions post). I don't want to repeat myself too much, but let me just say WOW! What a beautiful, well curated shop!! So absolutely lovely that I didn't want to leave!! It felt like every ball of yarn, every little notion, every pattern and sample, and even the woven baskets were a found treasure. I really wish I had taken more photos of the shop. But this will just give me more of an incentive to return! Right? I was so overwhelmed, so in awe that I couldn't focus all too well. There was just SO much to see and take in! As that wasn't enough, guess who was working behind the counter? The aforementioned Tif of Dottie Angel! Tif was such a delight too. An absolutely lovely person in all ways possible, and completely understood what it like to be in utter awe of being in the presence of someone who inspires you and wanting to tell that person just how inspirational they are. Then speaking of inspirational, as my friends Jeni and Rebecca and I were comparing colourways against Jeni's complexion, who should walk into the shop? None other than Susan B Anderson!! Can you say massive fangirl moment?? And we're not just talking about me, my entire group of friends ecstatic to be in the same shop as Susan B Anderson too!! And can I say just how utterly sweet and humble Susan is? So, so sweet!! She didn't mind the 6 phones taking non-stop photos (she even joined in on the photography fun and blogged about here, can you spot our photo?) and the requests for photos to be taken with her. I loved how she was Instagramming the yarn shop experience right there in the shop too! The gang and I with THE Susan B Anderson!! Once Susan left the shop (she had a class to teach), we continued on with our shopping. I may or may not have bought a sweater's worth of a yarn that is being sold exclusively at Tolt, dyed by someone who I was really hoping to meet in person: Veronika of Yarn on the House. Again, maybe next time when I make a much longer visit to the shop. And hopefully by then I'll have that sweater's worth of yarn all knit up in an actual sweater! There were SO many lovely yarns in Tolt, that it was extremely hard to not pick up one of everything and take it home with me. In the end I proudly stuck with my game plan of buying only yarn that I wouldn't be able to get back home. Yay!! Because it's not "souvenir yarn" if you can buy it at home, right? And then after seeing all the gorgeous cakes, balls, skeins, and hanks of rustic and tweedy yarns, I really wanted to go home and pull out everything that I had that is rustic and tweedy and just start knitting! But then the heaps of WIPs that I still have on the needles brought me back to reality. Phew! So all in all the VKL trip was a great one. Much different from last year's event, but still a ton of fun. I've never been on a road trip with these friends before and it was great to see that no cat fights broke out, claws were all kept intact, and everyone came home still friends. I shared a hotel room with Jeni and Rebecca and I'm SO glad that I got to spend this much quality time with them and got to know them more! Even if it meant Rebecca and I keeping Jeni awake until the wee hours of the morning gabbing away! And strangely enough, no knitting was involved during our gab-fests... Hmm...and no pillow fights erupted either, cause I know some of you are wondering that too! But thank you Jeni and Rebecca for the extra fabulous time!! ♥ And of course to Cate and Theresa for the poops and giggles! Now, this post is just getting way too long, and I haven't even started talking about my haul. So you know what that means. Yep, a separate post. It will happen within the next day or two. I swear!! Sorry kids. But I've got a fancy donut date with the Mister to jazzy myself up for! You understand, right? Time with your Love AND donuts?? Come on!! Looks super fun! I feel exactly the same way about ferry trips as knitting time - flights & airports, too! I sometimes wonder what I did before I became a knitter!! Sometimes, as sad as this might sound, sometimes I look more forward to the ferry/car ride or the waiting time at places just because I know I can knit!! It was so great to meet you! Sounds like a whirlwind trip of the best kind. I'm gearing up to go to Tolt this weekend, and I have a feeling I'm going to want to take everything home with me too!